We strongly recommend Ram Katalan and his NorthStar Moving team for the BBB Torch Award. While their ongoing, day-to-day service alone has earned our recommendation, it has been their help during the ongoing wild fire crisis in the region that has truly demonstrated their character and their commitment to helping their San Fernando Valley neighbors. We began working with NorthStar in June 2007 when we shut down one of our warehouses and needed additional capacity. As a manufacturer, we have frequent last-minute changes to production schedules that require our raw material warehouses to be fast and flexible to ensure our production lines keep running. Ram has proven that- even though he is new to the business of serving manufacturers like us – that he can provide urgent turnarounds in just hours, at all hours, when other providers take days. When the wild fires began threatening our finished goods distribution center in Valencia on Monday, October 22nd, we began an urgent exercise to protect key finished products before it became too late to save them. Within an hour of our phone call, Ram had reconfigured and secured adequate warehouse space to receive our evacuated finished goods – as a contingency plan – with no strings attached. He put his team on alert that they would be required to work around the clock if necessary to support our emergency plan. He also installed an inventory tracking system specially designed to handle the unique tracking needs of our finished goods. 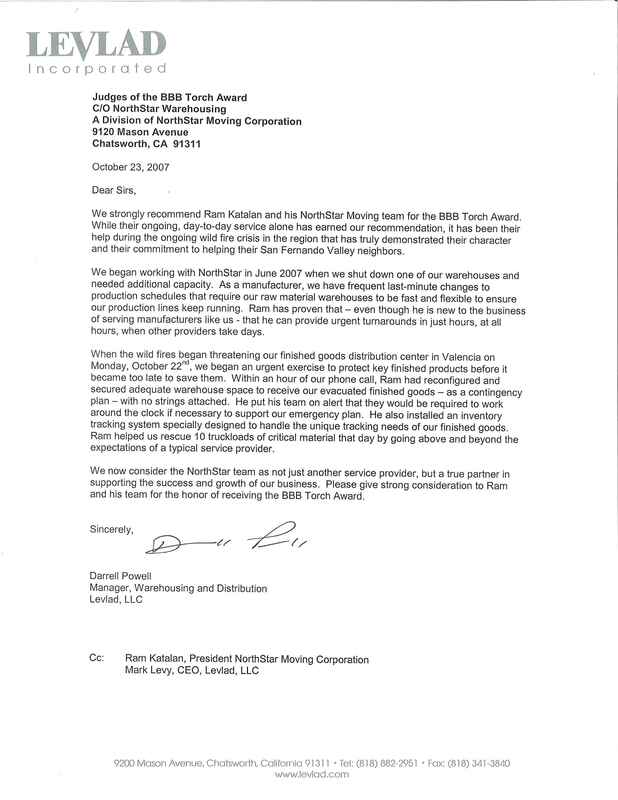 Ram helped us rescue 10 truckloads of critical material that day by going above and beyond the expectations of a typical service provider. We now consider the NorthStar team as not just another service provider, but a true partner in supporting the success and growth of our business. Please give strong consideration to Ram and his team for the honor of receiving the BBB Torch Award.